Learn from the master himself how to do it safely and correctly! 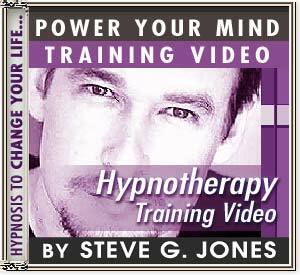 Steve G. Jones charges $1,700 for the 12-week Certified Clinical Hypnotherapist course at his hypnosis school, the world-famous Steve G. Jones School of Clinical Hypnosis, but now he shares his techniques in this effective Hypnosis Training Video in Download format. All you have to do is watch the video and do the fun and easy exercises. Of course, I’m fascinated by hypnosis. I’ve made a career out of it! And I get so much satisfaction from teaching others all that I know about hypnosis. I get calls and emails from lots of different people around the world with questions about hypnosis. Several years ago I hired a production crew to create a video where I teach the basics of hypnosis. In this video I talk about the different components of a hypnosis session. I discuss the induction, deepening, script, amnesia, and trance termination. These are the five steps to a hypnosis session and they all involve different things. If you are interested in hypnosis either as a career or for education, I encourage you to explore the field. It’s an exciting topic to learn about and great thing to practice! Being someone who is extremely familiar with the power of hypnosis, I can say without a shadow of a doubt that Clinical Hypnotherapist Steve G. Jones is among the best in the world. Dr. Steve G. Jones charges $25,000 for two hour sessions with top executives, actors, directors and producers.